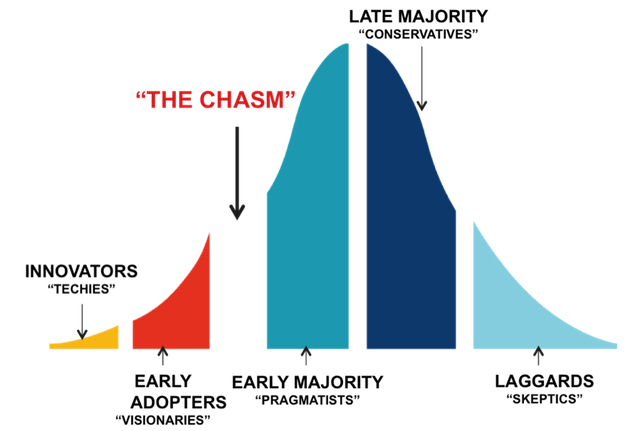 Article is about key ideas behind “Crossing the Chasm” — a bestselling book by Geoffrey Moore. Moore’s concepts clarify why so many high tech companies eventually collapse despite positive feedback from their first clients. Every high tech product has to wade through several stages of its life cycle. In between each of those stages there are gaps a company needs to bridge to avoid crash. Does this book has weak points? Why cross the chasm to reach mass market? What makes all the difference? What lies in the chasm? Isn’t a massive advertising campaign enough? What is the first stage of such relationships? Find enthusiasts, captivate visionaries. That’s it? How long should you work within a limited segment of market? How to tell big segment from small segment? What type of consumers populate primary market? Which of them guarantee profit? Visionaries, enthusiasts — too smooth. What about adversaries and opposition? What is a whole product? “Crossing the Chasm” is a book about introducing your highly technological product to mass market. Its author, Geoffrey Moore, worked as a consultant for The McKenna Group and has accumulated a wide variety of knowledge about companies of Silicon Valley. Regis McKenna, the CEO of The McKenna Group, is one of the best and most famous marketers of Silicon Valley, who also played a critical role in foundation of Apple corporation. The book by Moore was first published in early nineties, survived several reissues and presented a sequential model of hightech production to emerge it into mass market. He later developed his ideas, publishing books like “Inside the Tornado” and “Escape Velocity”. A lot of popular business books, like “Purple Cow” by Seth Godin, contain numerous references to Moore and his ideas. Tech consumers in general are surprisingly conservative and reserved when it comes to new products. They either use what others do, or wait for a new device to be tested by others. This anticipation period is the “chasm” you have to cross. Tech world is not only full with stories of tremendous success but also catastrophic busts. This book will help you make your way safe and sound. To be honest, yes. IT and hightech dwell in the world of lightning fast changes and transformations, so some information about IT companies coming from the book is outdated. Giving examples of software and protocols long gone is nostalgic to some of us, but confusing and complicated to younger readers. Also, Geoffrey Moore used to be a professor of literature, which makes this book an easy pleasant read with clear statements, great explanations and many more. However as Crossing the chasm summary below will reveal – ideas might sound dull for current startup environment that already adopted Lean approach, fast feedback cycles and building prototypes. Because mass market is overflowing with IT-tech — one product better than the other — and potential customers often have hard times trying to make their choice. A company can have rock solid confidence about its product quality and technological advantages but never about the demand it is going to have. To survive and make itself profitable, a company has to cross the chasm between a product and customers. Companies like Microsoft and Apple are often used as a textbook example of immense technological success, but it is crucial to understand that the times these companies emerged were dramatically different. Bill Gates and Steve Jobs both started when there was no technological abundance and accessibility like we have today. According to Moore it is a difference between primary or early market and mass market. Primary market consists of technological geeks, up-to-date consumers and specialists who are able to appreciate and understand new devices. Mass market is filled with potential and indecisive customers who wait for a test-drive period to be over. A company needs radical changes to bridge that gap between markets. On early stages you primarily deal with enthusiasts and form a concept of a product to offer to masses. That’s how mass market is formed. It emerges from that early enthusiastic market and your job is to make it work. Ads are good but barely enough for a high tech product. First you need to get approval and appreciation from those who can fully understand it — from enthusiasts and tech heads. IT/Tech marketing is not just about sales — it’s about building relationships between company and customers. Think of it as a common cause and don’t expect it to form overnight, but don’t hang your head — the result will last for years. First of all, establish yourself on the early market stage. It is usually represented by people with IT education or similar and they will buy new product just because it’s new. These people can’t wait to get their hands on new technology. All the feedback you get from this customer category is very important. Advertise and spread the word on the internet to reach these people.They are not ready to pay a lot, but they will be the first people to provide you with accurate and extended feedback. The next stage is the market of visionaries. They possess enough intuition to recognise potential and strengths of new technology, predict its place in the future landscape and turn it into an efficient enterprise. They are ready to take risks, use their influence and investments. Their strategy is simple: if your product is at the tip of the spear, they will have it to reach the top of success. That’s a favorable scenario, but sometimes marketers make mistakes, companies make wrong moves, choose wrong distribution channels, can’t find investors and simply fail. Sometimes visionaries receive raw, unfinished product and that’s where it ends. But problems are solvable, you just need to be active. You cannot conquer market without solid strategy. Moore offers the strategy and compares it with Normandy episode of World War II. The first market segment is like the Normandy landings. You need to conquer the segment and dislodge your enemies. Then you move forward to new segments of market. The chasm is like La Manche — you need to bridge it by force. Concentrate on one segment, conquer it and move on to the next one to eventually gain leadership over market. Market segments are parts of market space, which have their borders. Market segments are defined by market researches, performed to analyse what’s best for your company and what is the target segment for your product. Target segment is one segment, or a number of segments, which suit best for marketing a certain product. In addition to all that, company has to identify its strengths, scope of market, establish channels of distribution and define its profit margins. Market segments fluctuate over time, so new opportunities always come and the existing always go. Once the segment manages to provide strong revenue stream, you can proceed with your expansion, but don’t hurry. Moore expresses an opinion that the goal of high tech products marketing is to become a big fish in a small clean pond, instead of being a small fish flopping about in a huge overpopulated lake. If the segment you enter is too big, split it into smaller ones and conquer them one by one and if the segment is too small, just expand it. At a smaller scale a Cohort Analysis is used to define segments. Choose what suits your size. If you plan on a ten million dollar revenue stream, you probably already have five million dollars coming from your current segment, and plan to have five more from the future segment. A segment needs to have a definite set of requirements, provide a similar reaction to your product and big enough to make it worth the expenditure. You are going to have to make some adjustments to your marketing strategy. and late majority — conservatives, “old school” consumers. Most high tech products companies fall right into the gap between these groups. Pragmatics come in handy once you’ve launched your project, presented it to the world with the help of visionary and it’s time make profit. Pragmatics want to use your product but they wish to know what’s the experience like and what is other people’s feedback. It’s hard to earn their attention and trust, but once you’ve made it — it’s a long-term partnership. Conservatives believe in traditions rather than progress. They tend to invest money in proven tech and dislike uncertain and risky expenses. They love products with a single function: a phone must be just a phone, not a cameraphone combined with laptop. They prefer moderately priced, moderately new and highly reliable products. It is important to build strong relationships with both pragmatics and conservative for successful marketing promotion. Conservatives keep your infrastructure and pragmatics give you a chance to reach new territories. According to Moore, these are sceptics. They only see hightech products as expenses with no positive effect on productivity of their company. And high tech marketers even have an example for such scepticism — human factor! Meaning that if high tech product saves employee’s time it doesn’t imply one is going to spend this extra time to work. And what if not everyone has managed to master new product yet? So, sometimes sceptical criticism makes sense: a product must present a full scale solution, a complex of measures and tools to make life and production more efficient and also be easy to operate. Sceptics often point out discrepancies between sales claims and delivered product. The smart thing to do is to perfect the product and leave no reason for criticism instead of ignoring it. Sceptic specialists constantly look for new tech products. Investments lie outside of their interests but they are highly interested in high tech itself. Sceptic users follow new developing markets and brands. If you manage to make your product live up to the highest standards of current market, those sceptics are going to turn their eyes to its creators. Every high tech product has a discrepancy between claims and delivery, and needs joint products to become a whole product. What one gets in the beginning, paying for minimal configuration is called a primary product (idea seems to be similar to Minimum Viable Product (MVP). As market gets flooded with new joint products and the primary product gets better due to constant feedback, that product turns into a potential product. And that means a product with a potential to become a whole product. Just creating a whole product is not enough. You need to manage it right. Get rid of redundant elements, provide perfect conditions for cooperation between marketing and production and make sure to establish long-term relationships with consumers. Back in the day high tech companies could act as a single player on the market field, but times have changed. Now it’s all about alliances creating and promoting a whole product together: marketers, manufacturers, investors, etc. That’s when you’re going to need a solid positioning statement. Your product has to fill customers’ existing needs and more. It has to be new, unique and a notch better than its competitors. Moore mentions Silicon Graphics as an example of great product positioning in Hollywood. Their consumers were film studio editors, high caliber professionals, who needed a full array of tools at their disposal. Silicon Graphics allowed them to perform digital editing with their workstations, which included all film editing interfaces, unlike workstations by Sun, IBM и HP. Establishing contacts with business press and media can come out to be extremely helpful for product positioning.